Editor: Hi, Tommy. It’s nice to see you again, and congrats on your Oscar win. 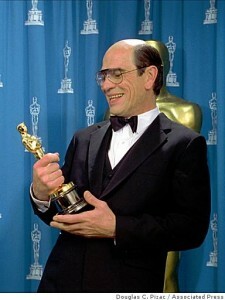 Tommy Lee Jones: Thank you very much. It’s nice to see you again, too. E: Did you expect to win? TLJ: Well, I had hoped to win, but I have learned never to expect anything. E: You looked so uptight while they showed your clip. Why? E: Yes, I think so. TLJ: I just wanted it to be over with. I’m glad I won. Otherwise I would have been depressed for the rest of the night. E: Your wife looked very nice. I understand you wore your wedding tux. TLJ: Yeah, it still fits. E: Were you too cheap to buy something new? TLJ: Uh, too lazy, I guess. What’s that perfume you’re wearing? E: It’s called Navy. What’s yours? TLJ: Mine’s called Good Ol Boy, it’s brand new. I’m going to be the spokesman for it. E: Are you finding yourself being offered more jobs since your win? TLJ: Yeah, The Original Cookie Company finally called back and offered me a full-time manager position at the Galleria Mall. But I’d never be able to commute. E: Much to everyone’s surprise, you thanked Harrison Ford in your speech, and it was even more dramatic because you thanked him last. Why? TLJ: Well, I decided he is a nice guy. He can’t help it that he’s rich but his wife is ugly. He really should receive some kind of award someday. After all, he’s been in so many successful films. There should be some reward for that. E: Yeah, it’s called his take-home pay. TLJ: I guess you’re right. But even the richest men can feel worthless if they never win awards. Awards give them credibility, which I now have. Heh Heh. E: OK. Which role do you think Harrison needs to play to be able to win an Oscar? TLJ: I think he needs to play Barry Gibb in the Bee Gee’s Life Story. TLJ: He’d have to win because that would be acting. E: Yes, I see your point. Has Mike Nesmith contacted you since you laughed at him? TLJ: As a matter of fact, he did. He told me I would have looked much better had I painted Liquid Paper on my head instead of being bald. What a Looo-Hooo-Zer! E: Well, he was hurt that you laughed at his fashion statement. TLJ: Oh, so that’s what it was. E: Tommy, I’d like to ask you some more personal questions to give the readers an insight of what you’re really like. E: What’s your favorite TV show? E: What’s your favorite group of the 70’s? TLJ: Um, it’s a tie between ABBA and The Bee Gees. TLJ: Does Your Mother Know. Bum Bum Bum Bum Bum Bum…Love that intro. E: Favorite Harrison Ford hairdo? TLJ: The Empire Strikes Back. E: Favorite Sissy Spacek movie? E: Favorite Bee Gees song? E: Favorite kind of sneaker? NOTE: This is a joke interview – nothing in here was stated by Tommy Lee Jones. Please do not take anything seriously.